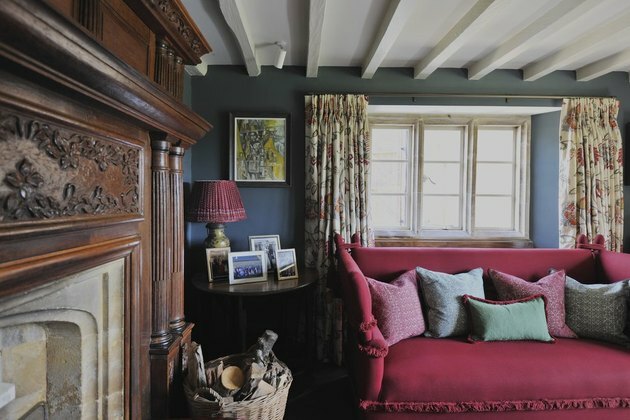 The English country living room draws inspiration from its rural surroundings. It's a relaxing, comfortable space that invites you to escape the city and curl up in a cozy armchair with your favorite book and a nice warm cup of tea. 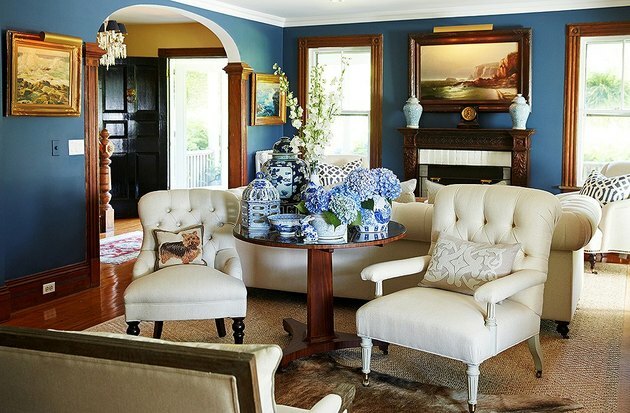 English country living rooms are typically styled with a quaint charm, that exude character and a timeless sense of history. Here are 13 lovely ideas to turn your living room into the comfy, pastoral den you never want to leave. 1. Exposed wood beams add rustic charm. 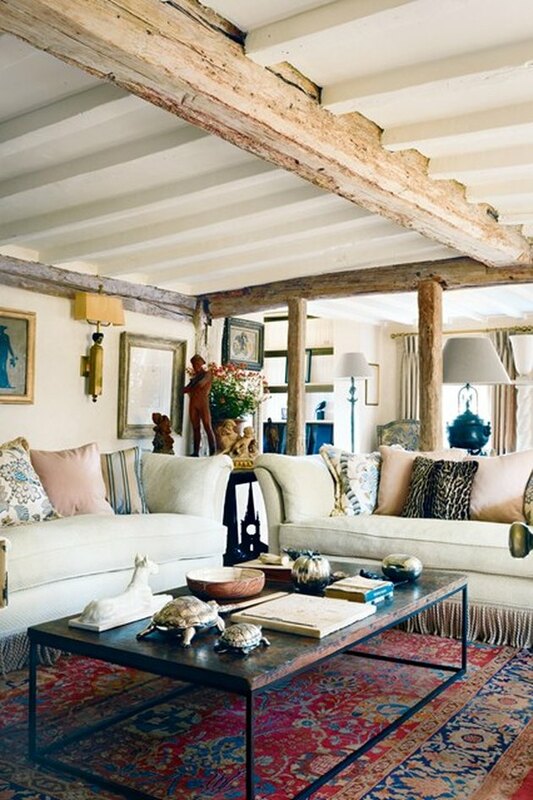 Exposed wood beams add a rustic presence to your living room that keeps with the rural theme of the countryside. Original structural beams are ideal, but when not available, you can add exposed wood beams to your ceiling with a fun DIY challenge. A common thread seen in most English country homes? Books, books, and more books. If you don't already have a large collection of reading material in your library, peruse yard sales, vintage stores, and flea markets to fill up your bookcases. English country style presents the perfect opportunity to breathe new life into old furniture. Antiques can add a sense of history and warmth, not to mention sentimental value if it is something that has been passed down through your family for generations. 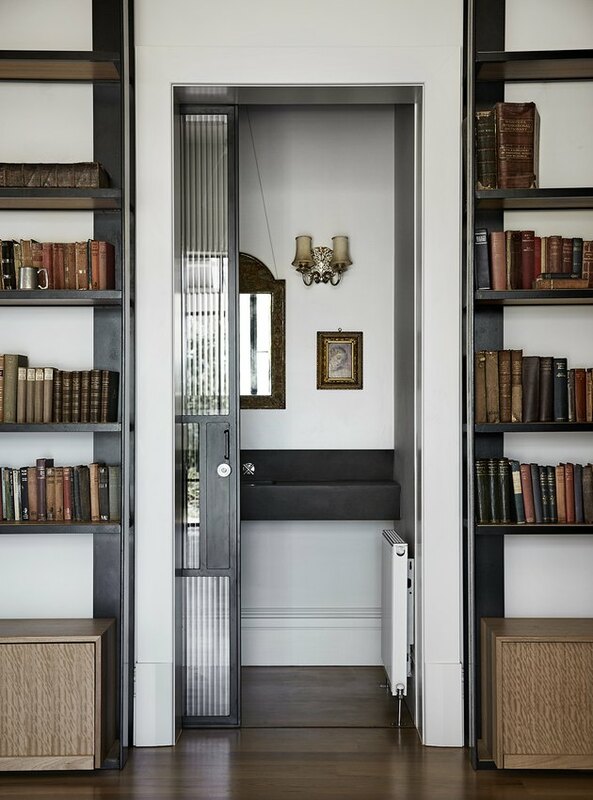 So dust off that bookcase that has been collecting dust in your garage, and fill it with beautiful books to complete your new provincial space. 4. Equestrian and canine artwork is a must. Horses and dogs are a common fixture in the English countryside, so it's fitting that they would have a place in English country style. Show your four-legged friends some love and create a gallery wall dedicated to them. 5. Employ muted earth tones. Consider the atmosphere of the actual countryside when choosing a color palette. 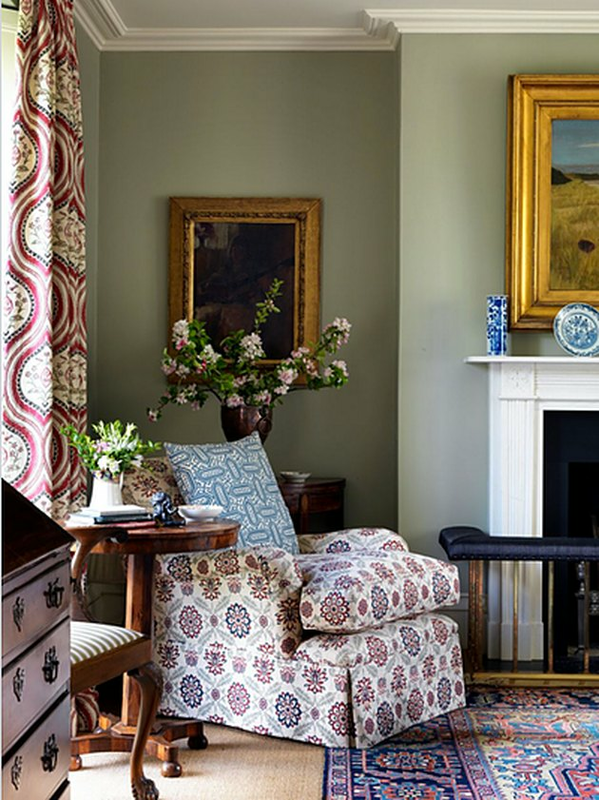 Soft muted tones — in verdant greens, earthy browns, sky blues, and flowery pinks — that celebrate the outdoors are ideal for an English country inspired room. 6. Toile motif wallpaper is visually dynamic. 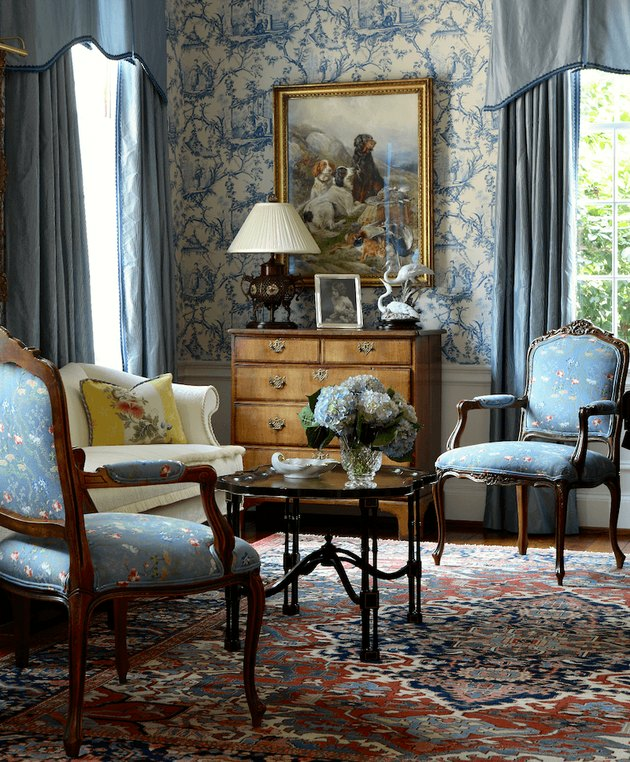 A bold wallpaper is always a good idea for an English country home. Go for traditional prints that are reminiscent of the outdoors, like florals, pastoral scenes, or toile. Similarly to wallpaper, floral prints and country scenes make great drapery fabrics. 8. Lots of comfy seating, perfect for entertaining. Don't bother with a perfect sectional or matching love seats, a hallmark of English country living is its comfortable seating. Your living room should be adorned with soft blankets and decadent pillows that are plush and comfy. 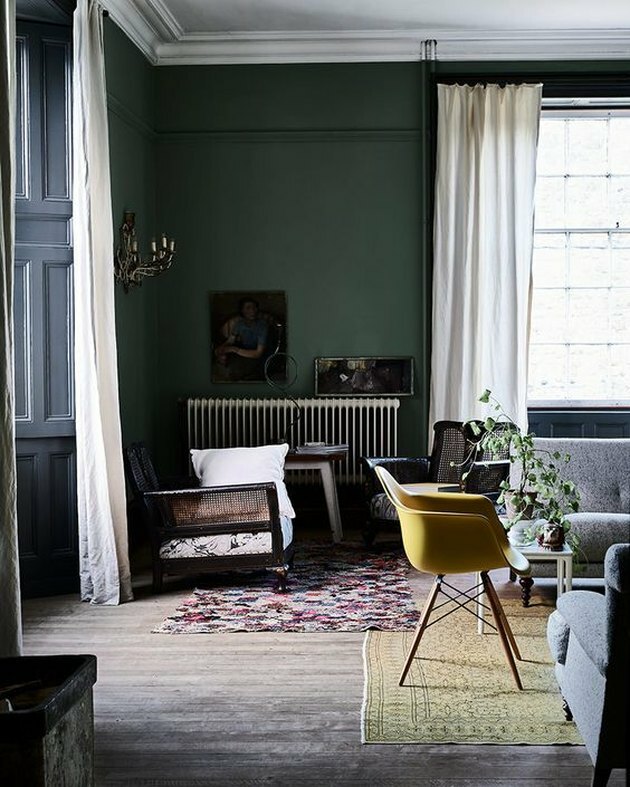 Whether to enjoy a good read, or sip a warm cup of Earl Grey, the style is all about feeling relaxed. 9. Experiment with layering area rugs. 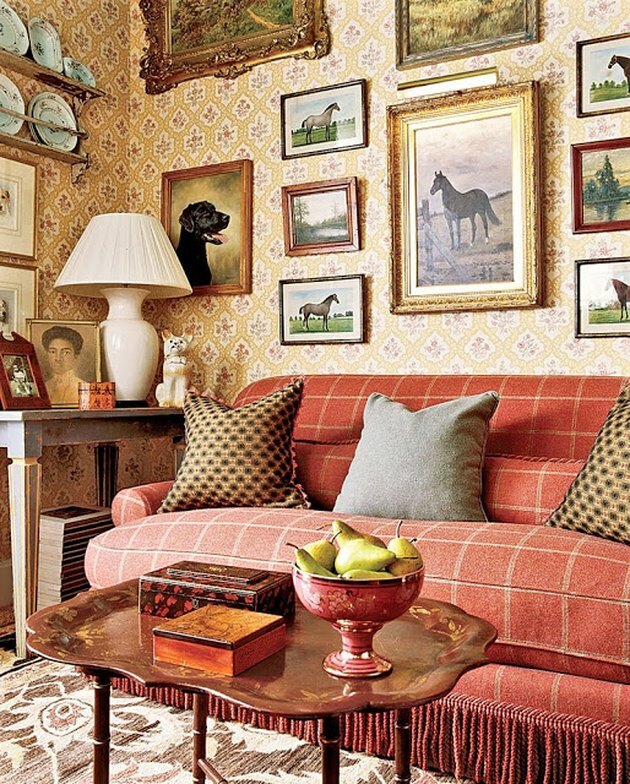 The English country aesthetic is all about using texture to add a sense of warmth and comfort. We love the soft, snug as a bug in a rug vibe that results from layering tapestries on the floor. 10. Carve out space for a cozy reading nook. Now that you have all of those books, you need a cozy nook where you can relish reading them. Make room for a plush lounge chair or chaise, perfect for long periods of sitting, near a window and enjoy. 11. Display your tchotchkes proudly. 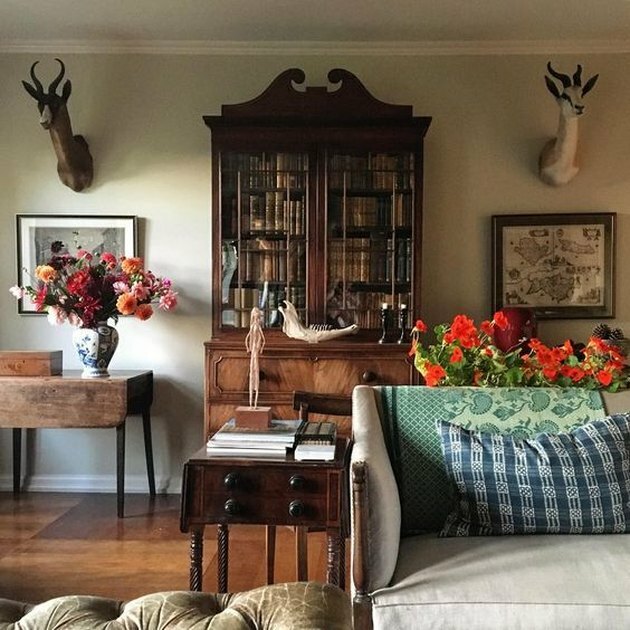 It's not uncommon to see an eclectic collection of tchotchkes displayed throughout an English country home. These carefully curated staples add a rich sense of history, that tell the story of a life fully lived. 12. Bring the outside in with fresh blooms. 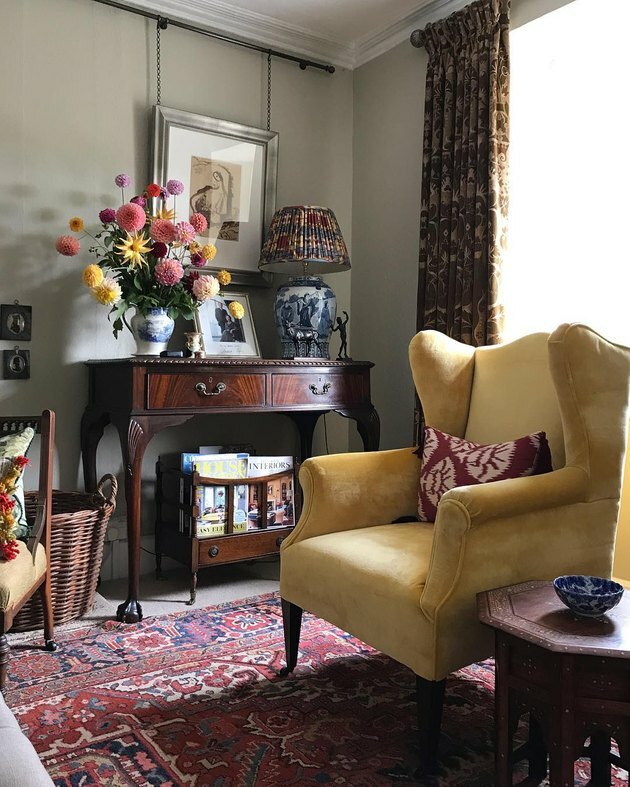 With a nod to the English countryside, fresh flowers are the best way to bring the outdoors in, not to mention a great way to put those vases sitting in your cupboard to work. Arrange one or two beautiful floral bouquets throughout your living room to add vibrant pops of color. 13. Make your living room cozy with a centrally located fireplace. The English countryside can be very cold and wet, especially in the winter, so a cozy fireplace is essential. This functional decor element creates a warm and comfy space perfect for gathering with family and friends. Don't have a fireplace? No need to panic. 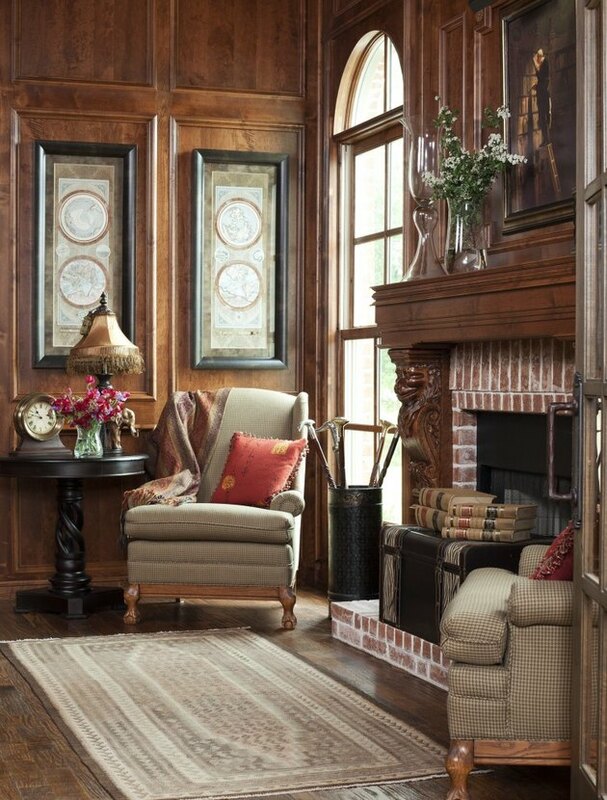 You too can enjoy its rustic charm by building a faux fireplace in your very own living room.